Outside of the Targums, the earliest recorded Jewish interpretations of Exodus 3:14 are in the Talmud and Midrash. These two sources between them span many centuries of Jewish religious thought, extending from the late Second Temple period to the early Middle Ages. The importance especially of the Babylonian Talmud in Judaism cannot be overstated and so whatever interpretations it contains must be very carefully considered. However, even irrespective of their importance to Judaism, these two bodies of literature between them contain the distillation of many centuries of devoted and meticulous rabbinic thought and so are deserving of careful consideration in their own right. Beginning with the Talmud, the most striking feature of the presence of Exodus 3:14 therein is its almost total absence. Irrespective of the meaning of this verse, it is at least a very prominent feature of the first encounter between God and Moses and we would therefore expect it to have been the subject of many a rabbinic interpretation, and it surely was. However, as far as I am aware, the words ehyeh asher ehyeh of Exodus 3:14a are cited on only three occasions in the Babylonian Talmud and the ehyeh of 3:14b only once. I am that I am: The Holy One, blessed be He, said to Moses: Go and say to Israel: I was with you in this servitude, and I shall be with you in the servitude of the (other) kingdoms. He said to Him: Lord of the universe, sufficient is the evil in the time thereof! Thereupon the Holy One, blessed be He, said to him: Go and tell them: I Am has sent me unto you. The declaration ehyeh asher ehyeh is thus interpreted as a statement of God’s abiding presence with Israel, while the ehyeh of 3:14b is interpreted as a shortened version of that declaration and as a gesture of God’s compassion towards Israel in response to Moses’ appeal on their behalf. There are a number of problems with this interpretation. First is the implication that God commanded Moses to “Go and say to Israel” the words ehyeh asher ehyeh before commanding him to say to them only the ehyeh of 3:14b. According to the Bible, however, Moses was not commanded to say the words ehyeh asher ehyeh at all. He was commanded to say to the Israelites only that ehyeh had sent him to them and so this interpretation would appear to be based upon a misunderstanding of the biblical text. My second objection is that if God had simply wanted to inform Moses that He is always with Israel in their troubles, then He could have done so by speaking just a few additional words and in so doing could have saved many generations of debate and incomprehension. I find it highly implausible that the response God made to the foremost question put to Him by Moses would require so simple an addition in order to render its intended meaning clear and yet it was spoken by Him in such a way as to make it very obscure. My third objection is that the Bible does not record Moses as having said anything to God between the declarations of 3:14a and 3:14b, but this interpretation requires us to believe that he did. 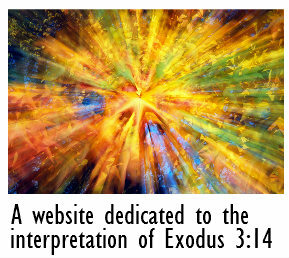 My fourth and final objection is that the meaning of Exodus 3:14 as presented in Berakoth 9b is very unremarkable by biblical standards and yet the biblical account informs us that the words of this verse were highly significant to Moses and to the Israelites in servitude and to this day they continue to intrigue and fascinate almost everyone who gives them careful consideration, and so also for this reason I find the interpretation of Berakoth 9b highly implausible. The other two Talmudic citations of Exodus 3:14 are in Shebu’oth 35a5 and Baba Bathra 73a3, both of which present a very different understanding of the verse to Berakoth 9b2. Both of them make reference only to the phrase ehyeh asher ehyeh and both identify it as a Divine name. However, they make no further comment upon it and so there is no explanation for how or why it was so understood. Shebu’oth 35a identifies ehyeh asher ehyeh as one of the Divine names that may not be erased, this in the context of written oaths where such names could conceivably feature and so be disposed of when the oath had been discharged. Baba Bathra 73a implies that ehyeh asher ehyeh is a Divine name by listing it alongside two other Divine names, Yah and YHWH Tzevaot, all three of which are inscribed on wooden clubs with the power to curb a powerful wave, which presumably symbolises Christianity. These two interpretations are the first of many in Judaism to have identified ehyeh asher ehyeh as a Divine name. The problem with such an identification is as already noted, that if there is a Divine name in Exodus 3:14, then a plain reading of the biblical text informs us that it must be the ehyeh of 3:14b. Moving on to the Midrash, I will consider only the largest and most important collection of midrashic literature – the Midrash Rabbah – in which seven rabbinic interpretations of Exodus 3:14 are recorded. Six of these are in Exodus Rabbah 3:6 and one in Leviticus Rabbah 11:5. Several of these interpretations have been adopted and adapted by later exegetes and so have had a lasting impact on the interpretation of the verse. For this reason I will briefly consider each of the seven in turn. All translations are taken from the Soncino Midrash Rabbah. The first of the six interpretations relates only to ehyeh asher ehyeh of 3:14a. It interprets this phrase as a declaration by God that, depending upon the work He is then performing, He is to be known by one of four biblical (as opposed to rabbinic) Divine names, “hence ehyeh asher ehyeh in virtue of My deeds”. I have no idea how or why this interpreter discovered this seemingly arbitrary meaning in the words of Exodus 3:14, but its continuing influence can be seen in Tigay’s interpretation of the verse in the 2004 edition of the Jewish Study Bible. The second interpretation in Exodus Rabbah identifies all three occurrences of ehyeh in Exodus 3:14 as together denoting the immutability of God. It reads, “God said to Moses: “Tell them that I am now what I always was and always will be”; for this reason is the word ehyeh written three times”. The most obvious objection to this interpretation is the same as that brought against the interpretation of Berakoth 9b, which is that Moses was not commanded to say ehyeh asher ehyeh to the Israelites and so the message he was to convey cannot be contained in a threefold utterance of ehyeh. This interpreter does not clearly discern a Divine name in the verse, but in the eighteenth century Moses Mendelssohn refers to this interpretation in his own exegesis of Exodus 3:14, and there he does explicitly identify all three occurrence of ehyeh as together comprising a Divine name. Mendelssohn also finds in this midrash a notably different meaning to the one most apparent, regarding it as a statement of the eternality of God as opposed to His immutability. The third interpretation is a fuller version of Berakoth 9b in which the interpretations of ehyeh asher ehyeh and the absolute ehyeh are almost exactly as they are in Berakoth 9b. The most notable difference between them is that although God is again depicted as having first instructed Moses to say ehyeh asher ehyeh to the Israelites before responding to Moses’ appeal with the command to say only ehyeh to them, it then adds that the words ehyeh asher ehyeh had only ever been intended for Moses’ ears. This emended version of Berakoth 9b improves upon its predecessor by virtue of its acknowledgment of the plain meaning of the biblical text, but the way in which it is written still does not correspond to that plain meaning. There also remain the other problems noted above, namely the absent question between the two declarations, the implausibility of such a simple addition to the declaration not having been spoken by God in the first place and the implausibility of such an unremarkable meaning being expressed in what are apparently very remarkable words. The fourth of the six interpretations in Exodus Rabbah is along similar lines to the third and does not require further comment. The fifth interpretation of Exodus 3:14 reads as follows in the Soncino Midrash Rabbah: “I am that I am to individuals, but as for the mass, I rule over them even against their desire and will, even though they break their teeth”. There is no explanation for how or why the interpreter so understood it, but I would suggest that the reference to ehyeh asher ehyeh as a designation of God’s disposition towards individuals must refer to God having intended these words only for Moses and may even be regarded as a discreet acknowledgement of that. The word ehyeh on the other hand was to be addressed to the Israelites, and so the second part of this interpretation presumably means that the absolute ehyeh designates a contrasting disposition, namely that of God’s uncompromising rule over the Israelites collectively. What is most interesting about this interpretation is that if there is a Divine name in this verse, then this interpretation would appear to be suggesting that there is one name that designates God’s disposition towards individuals and another that designates His disposition towards the masses, which would mean that there are two Divine names in the verse with different meanings, although the meaning being attributed to ehyeh asher ehyeh is not at all clear. However, as already pointed out, the biblical text does not support the identification of ehyeh asher ehyeh as a Divine name and so this interpretation cannot be correct. The sixth and final interpretation in Exodus Rabbah relates only to ehyeh asher ehyeh and interprets it as a declaration that God will manifest Himself in His creation howsoever he pleases. This interpretation is reflected in that subsequently adopted by Buber-Rosenzweig and has become a fairly common interpretation of the verse. Finally to Leviticus Rabbah 11:5, which follows the Talmud in its identification of ehyeh asher ehyeh as a Divine name, but curiously suggests that it is only a temporary name. The interpretation is that Moses had shown a lack of directness in his request for God’s name and that God responds in like manner as follows: “This is My name for the time being: ehyeh asher ehyeh”. The greatest objection I have to this interpretation is as already noted, that Moses was not commanded to say ehyeh asher ehyeh to the Israelites and so it is obviously not the Divine name in this verse. Two other obvious problems are first that this rabbi does not explain, and I cannot imagine, what a temporary name could signify in the designation of an unchanging and eternal God, and second is the suggestion that God could be prompted to behave petulantly, which is nonsense. For those who do not know, in Judaism the Talmud is designated the Oral Law and the Torah the Written Law. Orthodox and more traditional Jews believe that the Oral Law was revealed to Moses on Mount Sinai at the same time as he was given the Torah, and that the Oral Law was passed down by him through many generations of sages before being written down and ultimately sealed in the Talmud. The Talmud has from the time of its closure been invested with enormous authority in Judaism and continues to be the sole basis of Jewish law (halakhah) to the present day. Such is the Talmud’s authority that the mere suggestion that it contains an erroneous reading of the biblical text – such as the identification of ehyeh asher ehyeh as a Divine name – would not even be contemplated by many Jews today despite the clear biblical evidence that such is the case. It is, therefore, perhaps unsurprising that despite the obvious irreconcilability of the words of Exodus 3:13-14 with the Talmudic identification of ehyeh asher ehyeh as a Divine name, the tradition of misidentifying it as such was nonetheless preserved in post-Talmudic rabbinic writings and in Judaism generally and continues to the present day. However, the story of Exodus 3:14 in the Talmud does not quite end there. There is one other passage that, although making no mention of the words of Exodus 3:14, does I believe shed light on how the four enigmatic words of this verse were understood and celebrated in Mosaic times and does so in a way that is perfectly compatible with the biblical text and that perfectly reflects their importance to Moses and to Jewish religious observance. I will consider that passage in an endnote to a later part of this website (endnote 40).